Trends are not always easy to keep up with, but when it comes to keeping your kitchen up-to-date, these 10 kitchen trends for 2017 might be worth it. Interior Designers are confident that the following trends will rule in kitchens this year. Take a look at these trends and get inspired for your next kitchen remodel, you might even increase your home’s value. Trend #1: Colorful cabinetry. White cabinets are on its way out! Colorful cabinets are on the way in – look for dark colors like navy, black, deep charcoals on lower cabinets and islands with contrasting neutrals on upper cabinets. Trend #2: Personalization. Personalize with hints of color ranging from pink and black to jewel tones. Use materials that emphasize geometry and texture. Consider using area rugs and runners to add more personalization. Trend #3: Jewel Tones. Who doesn’t want a little bling in their kitchen. We are expected to see more sophisticated tones like, turquoises, emeralds, sapphires, ruby reds and golds appearing in back splashes, fabrics, hardware and possibly even range hoods. Trend #4: Flat-panel cabinet doors. While the popular shaker style door may still be around, expect to see more simple and clean lines with slab or flat-panel doors. Don’t expect it to be boring though, textures such as rift cut oak will make up for that. Trend #5: Tactile textures. Plan to have your sense of touch enticed. 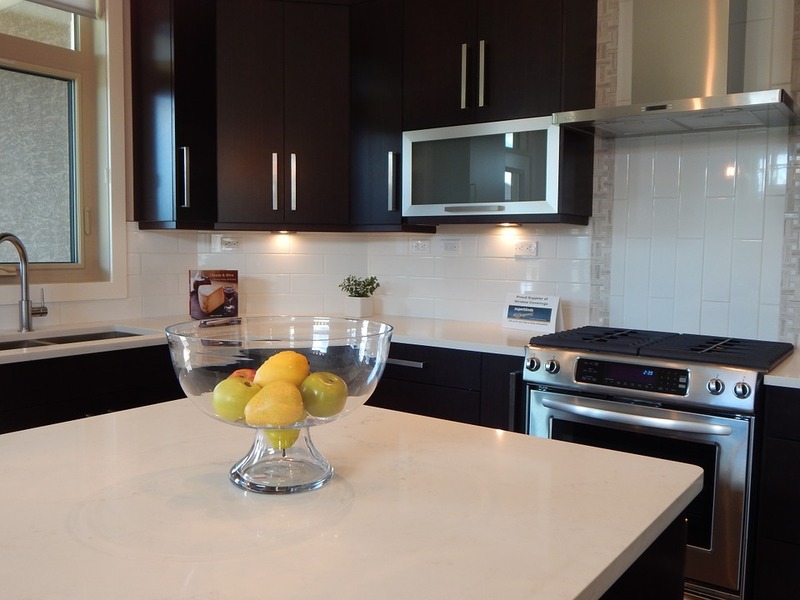 You might see a tile with a wavy relief next to a honed counter top paired with cabinets with a high-gloss finish. Three completely different textures all in one space. Trend #6: Pops of pink. Pink is in! Not bubblegum pink of course! Accents of rose gold and more of a muted, dusty pink on items such as small appliances, dish towels and window treatments can really brighten up your kitchen. Trend #7: Smaller, smarter appliances. Smart phones are more than just for checking emails and Facebook. More homeowners are expected to use their smart phones to program smaller appliances. Can you imagine monitoring your cooking from your smart phone? Trend #7: Geometry. Be ready to see more geometry in kitchens in 2017. When it comes to your back splash, plan to use more angular shaped tiles. Larger tiles in more structured shapes like chevron, herringbone and hexagons will be popular as they provide contrast and dimension. Also, look for longer and wider subway tiles which can be visually appealing for a clean and crisp design. Trend # 9: Low-maintenance spaces. Low maintenance products that are easy to clean will be key. Products like, porcelain, quartz, large-format tiles require less maintenance and upkeep. Floors and back splashes with larger-format tiles means less grout to clean. Smaller appliances can also cut down on upkeep – consider using a smaller steam oven for roasting small items instead of your larger built-in oven. Trend #10: Feature windows. Windows are not just for letting light in, they can be a stunning accent piece or focal point. Look for windows with interesting shapes in dark frames for a more dramatic effect. Create even more drama by hanging windows higher and longer to pair with draperies.